The climate summit in Poland has been given a boost in recent weeks by well-timed climate change reports shaping the news agenda. But if we dig deeper than most of the media did, these reports demonstrate what is wrong with global warming policy discussion. COP24 : faudra-t-il attendre la 99e pour admettre l’échec ? 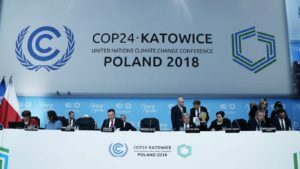 La COP24 est enfin terminée et, comme à chaque fois, sans aucun résultat concret pour la diminution des émissions de CO2 malgré les cris d’alarmes des ONG environnementales, du Secrétaire général des Nations Unies et des foules de citoyens. Et pourtant dans un an, on va de nouveau nous bassiner les oreilles avec la 25ème COP tandis qu’on observera encore une fois l’augmentation des émissions. Comme à chaque fois, par l’entremise des media, on nous rappelle que notre planète va devenir un enfer comme Vénus, que le niveau de la mer va nous engloutir et que la biodiversité va disparaître. Rappelons tout d’abord ce fait : aujourd’hui l’Union Européenne ne représente que 11 % des émissions mondiales de CO2, la Chine 28 %, les États-Unis 15 %, l’Inde 7 %, la France 1 % et la Belgique 0,4 %. Patricia Adams is an economist and the executive director of Probe International, a Toronto based NGO that has been involved in the Chinese environmental movement since its beginnings in the mid-1980s. She is confirming much of what I have said in recent years. The only thing I would take issue with his her description of there being a U-Turn. In my view, China never had the slightest intention of being serious about cutting emissions. COP21 does not define the scientific basis of the agreement for the warming effects of the anthropogenic emissions, but it refers to a scenario. This scenario has not been defined in the COP21, but it can be found. The scientific resource of United Nations as well as of the COP21 is IPCC. The exact specification of IPCC is (Summary for Policymakers. In: Climate Change 2014. Mitigation of Climate Change”): “Baseline scenarios, those without additional mitigation, result in global mean surface temperature increases in 2100 from 3.7 °C to 4.8 °C compared to pre-industrial levels (range based on median climate response; the range is 2.5 °C to 7.8 °C when including climate uncertainty)”. Even though IPCC refers to multiple scenarios in the text above, the surface temperature increase to the average value of 4.25 ⁰C means one scenario only. We are witnessing a holy alliance between Third World ecologists and big finance, orchestrated by the European Union, under the amused gaze of the American giant who has now taken leave of all this masquerade.